Bordeaux University life started in 1441 and has seen many evolutions. The city now competes on the international stage boasting 8 institutions of higher learning and many specialized colleges and schools such as business, language and wine. Bordeaux a hub for aeronautics and pharmaceuticals is happily the wine and food capital of the world. 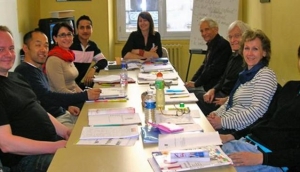 Bordeaux attracts the European community and international scholars and those who are keen to learn about French language and culture. The specialties of the Bordeaux region- viticulture and cuisine- are subject for countless courses too!